Another nice game for senior WR turned QB Drew Brenner. He adds a dimension of being capable of running the ball that makes Orrville's offense very dynamic and he threw the ball very well too. Kyle Lichti sat out the game due to the concussion he suffered against Wooster, but should be back this week. Great to have two guys capable of running the most important position on the field. There's a reason both of these guys will be playing D-1 football a year from now...both were difference makers. Stew had a great first half with an interception, a long touchdown reception and several good punt returns to set up Rider scores. Mason was his usual self on defense and made a Willie Mays-esque catch in the first half that set up a Rider score. Both are studs who can change the game at any time. Another game, another strong defensive effort. The first string only gave up 6 points, and again shut down a strong runner in LaBrae's Matt Szorady, limiting him to just 33 yards on 17 carries. The Rider D is absolutely locked in right now, only giving up 43 points in their last 4 games (all wins)..for an average of just under 11 per game. For the 2nd straight week, the Riders have not turned the ball over a single time....and that's been the case in 3 of their last 4...so maybe we've got that figured out? One thing I know...playoff turnovers can kill a team's season. Let's hope the trend continues. The 53 points scored by Orrville was 3rd most all-time in terms of points scored in a playoff game. The 59 scored by the 1999 Riders in a win over Akron Hoban is the record and the 54 scored by the '94 Riders against Benedictine was 2nd most. Congrats to Coach Davault on his 50th win last night. Mo Tipton took 77 games to win his first 50, and Coach McMillan took 75 games to get to 50 wins, and Coach Shunkwiler took 78 games to get to 50. Last night was Coach Davault's 71st game as Red Rider head coach....so he actually reached 50 wins faster than head coach in Orrville history...and I guess that's saying something. I was like a kid at Christmas playing that scoreboard video last night. So great to hear all the positive response to it. The goal was to play it as the team came out of the locker room, but we had a glitch in the audio and decided to play it at halftime. Liked seeing the students enjoying it as well as the players as they were stretching for the 2nd half. I've been asked to post it here, and I'm working on it, but the video format is proprietary to the scoreboard so it's not as simple as uploading it to YouTube. So this brings us to the long awaited matchup with WCAL's Norwayne Bobcats. It's the first time since 1981 that Orrville will play a Wayne Co. Athletic League team (the 1981 game was also against Norwayne and was a 29-0 Orrville win). The last time before 1981 was in 1966 when Northwestern beat an Orrville team 8-6 (Orrville was 0-9-1 that year). So it's been 55 years since a WCAL team has been able to claim victory over an Orrville team. I'd like to keep that streak in tact this week. The game will be played at Medina's Ken Dukes Stadium with Orrville being the home team. (Here's the rest of the week 12 matchups from the rest of the state.) We sat on the visitor side both times we played there last year (against Elyria Catholic and Chagrin Falls) but will be on the opposite side this year. Lots of parking on the Medina campus, but the lots on the north side of the high school will be the closest to our side of the field. This link says the stadium sits 5400, and I'm guessing every one of those seats will be full well before kickoff. This game has been so anticipated and hyped....I'm thinking an easy 7,000-8,000 fans could be there at kickoff. Get there early is all I'm saying. As far as the game itself...it will be a great atmosphere and be played by two teams who have earned their way there. 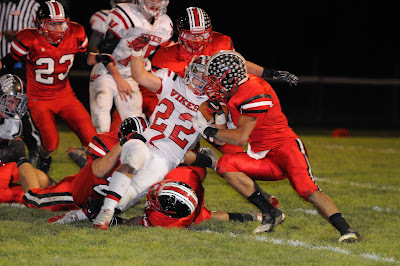 I like Orrville's chances with our defense and playmakers, but hope the turnover bug stays away from us. This is the biggest game in Norwayne history, but for Orrville, another week 12 game like it's been for the past 3 seasons. This is not the ultimate goal of our season, but a test that must be passed. I have faith in our coaches that they will prepare the kids well and it will be all business leading up to Saturday. I'd say this is easily the biggest game in Wayne County since Smithville and Dalton hooked up in a regional championship game in 2002....and the added involvement of the OCC vs. WCAL angle makes this one even more interesting. All three Orrville district buildings will sell tickets through the end of school on Friday. Tickets will also be sold at Carmichael Sports and at Expert T's on Main St. Presale is $7 with the school getting a cut of the presale revenue. All tickets at the gate will be $9. Something that struck me as I watched scores come in from around the state, and that was the lopsided scores, especially from games pitting #1 seeds versus #8 seeds and #2 seeds against #7 seeds. Only 1 #8 seed won a game (1 for 24) and only six (out of 24) #7 seeds were able to spring an upset. In the #1 vs. #8 games, the average margin of victory was 31 points, and in the #2 vs. #7 games (with the #2 seed winning) the margin was 29 points. My point is...there are teams that don't deserve to be called playoffs qualifiers and 8 teams per region is too many. Sorry, when a team loses 79-6, as was the case in Division 5 when Marion Pleasant beat Cincinnati Summit Country Day...that's not a playoff game....that's a scrimmage that turned in to a JV game in the 2nd half. My solution...either go back to only 4 teams making the playoffs per region, or knock it down to 6 teams per region and give the top 2 seeds a bye for the first week as a reward. But then again, the OHSAA will never agree to less teams (and less revenue) so why waste my breath? If you' keep your eye on other Division 4 teams, you no doubt know about Kenton's Maty Mauk. They slammed Wellington 74-22 (another case for too many playoff teams) last night and Mauk's performance was not only amazing, but record setting. The Missouri recruit was an amazing 27-for-29 for 505 yards and NINE touchdowns in the Wildcats win. Read this article for more stats from his amazing career. Kenton takes on Genoa this Saturday at Bowling Green.